The grandson of Barry Allen, Bart Allen was destined to tap into the mysterious speed force! After shedding his longtime alias of Impulse, the yellow-garbed speedster now battles with the Teen Titans as Kid Flash! Bart's got what has to be one of the most confusing origins in all of comics, rivaling even Venom's. It's much too complex to go into here, involving centuries-spanning time travel several times in several directions. Short version is that Bart's connection to the speed force was making him age at an accelerated pace, and his grandmother brought him to current Flash Wally West for help. To help his mind develop along with his body, he had been raised in a virtual reality environment, and that videogame mentality kept Bart from grasping the concept of danger and earned him the name Impulse. When he was forced by Deathstroke to actually stop and considering the consequences of his actions, Impulse realized that it was time to grow up. He ditched the Impulse name and costume, did some quick studying and returned to the Titans as the new Kid Flash. Some readers viewed the change was nothing more than a needlessly stupid Silver Age throwback that undid all the character growth Impulse had in his solo title - in that book, he'd been primed to be an adult Impulse, not the next Flash. But really, it makes good sense: he's finally grown up and is ready to accept his place in his grandfather's legacy, thus the change. Even the name works: how many hot DJs are "Kid (something)" these days? The costume is an update of the Kid Flash uniform Wally wore when he filled the role. Often described as the best superhero costume ever designed, it had red pants and gloves, a yellow shirt and boots and a red lightning bolt on the chest. It was indeed very good, but with just one exception, Bart's looks better. The color scheme is the same, and DC Direct did a good job of painting the figure. The matte red is just the right color, while the yellow has a hint of glitter to it that makes it look like more than mere cloth. There's a bit of problems where his legs disappear into his boots, with the red not quite reaching down to the line between the two. However, unless you're specifically looking for it, it's not noticable. Bart's gloves flare out, and have a lightning-shaped edge at the cuff. The wings on his ears, a longstanding feature of Flash costumes, are smaller and more streamlined than the gigantic earmuffs the first KF wore. While the red and yellow of Wally's costume butted together, Bart's got a black lightning bolt belt that seems inspired by the modern Flash design - it divides the figure nicely and looks damn nice. 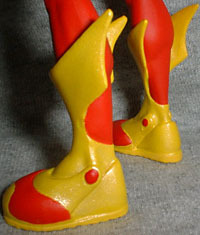 The weakest part of Mike McKone's design is the weird flares at the tops of Kid Flash's boots. They're probably supposed to look like lightning or something, but they end up with more of a Batman look - like something Nightwing would have worn with his disco-rific first costume. The technological embellishments on his feet are a great detail, and they certainly look better than the plain rubber galloshes Wally wore when he had the name. Simple logic time? Someone with super speed couldn't wear normal shoes any more than a racecar could roll on normal tires. It's about time an artist incorportated that into his designs. While the original Kid Flash just had a red lightning bolt on his chest, Bart got something a little more complex - his gets a red circle with a white background, more like the Flash has. For some reason DCD put a black outline around the symbol. Yes, it has one in the comics, but that's what we call "someone drew it." There should be no more of a black outline around the logo than there should be between his gloves and his arm or surrounding his entire body. However, despite some fans' claims, the symbol doesn't look like Professor Zoom's any more than Wally's did when he was Kid Flash. The sculpt is good, of course, particularly the head. John G. Mathews managed to make Bart look a bit younger than all his Titans teammates - a bit shorter, too. His hair is the tossled mess we've come to expect, and overall he looks great. This is obviously based more on McKone's art than any of the other artists who've been in charge of Bart over the years. Kid Flash moves at the usual nine points that DCD always gives us: knees, hips, elbows, shoulders and neck. With the big lightning bolt belt, it's understandable that he doesn't have a waist. His gloves are a separate piece from his arms, but not articulated - or if they are, the plastic inside them is so stuck together that they simply refuse to move. Not wanting a one-handed Kid Flash, I'm not going to force them. No accessories with this figure - Bart, even more than Wally, was born to run, so why would he need weapons? His assaults are based on a speed of legs rather than a force of arms. Other than those goofy boots (and maybe the extra bits on his logo), this costume is better than his predecessor's, and this is a damn fine figure. What do you think is the best superhero costume design ever? Tell us on our message board, The Loafing Lounge.